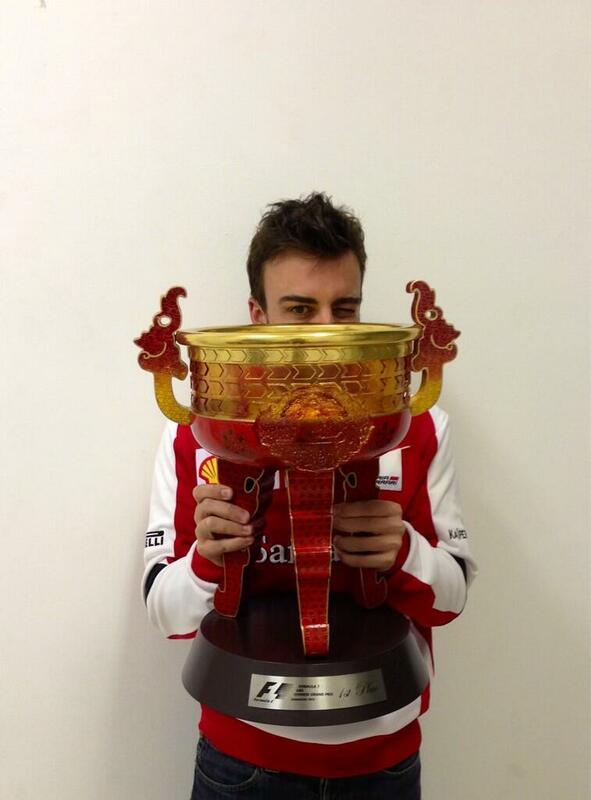 There’s that phrase again, and it’s one that definitely relates to Fernando Alonso. Time and time again, against the odds and in spite of a less than spectacular car Alonso finds himself at the sharp end more often than not, and this was demonstrated with his usual finesse throughout the 2012 season. The Ferrari looked strong all weekend for both drivers and with Massa having out qualified Alonso regularly this season it was of no surprise the Spaniard rectified this here. After an electrifying start that has now become a significant part of his repertoire, he challenged Hamilton immediately and once he secured the lead he went largely unchallenged for the race, leaving the fighting for other drivers. There was also a Finnish cream that rose well too, Raikkonen is keeping Vettel in close quarters, the German only has a 3 point lead that in the current climate can disappear all too quickly. Lotus are the only team to have scored in each race, but it is Raikkonen that is capitalising. Perhaps the quote that Webber will best be described by is not the now infamous not bad for a number two driver from Silverstone 2010, but ‘If he didn’t have bad luck, he’d have no luck at all’, and if people ever doubted that this race weekend proved it. Short fuelled in qualifying in Q2 he found himself left languishing out on track as the rest of the field pursued faster times. For a short while he was inside the magic top ten, but as the contenders shot out for a second go he was left in 14thplace. Inevitably he didn’t have enough fuel for a sample and he was demoted to the back of the grid. Come race day the team took the opportunity to optimise the car up for a full assault on the pecking order, with a new gearbox he started from the pit lane and within a few laps he was closing in on the points. 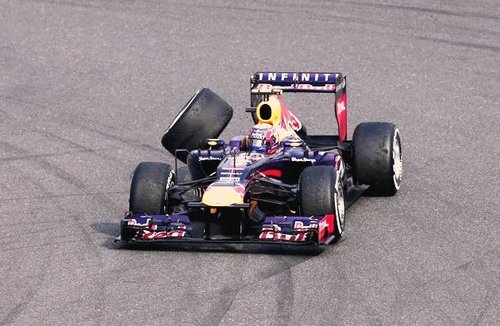 However a collision with Vergne sent him back to the pits which got him a new front wing and a fresh set of rubber. The right rear departed him on lap 16 and was last seen making a dash for Vettel’s car. As he heads to Bahrain he will be carrying a somewhat harsh 3 place grid drop for his tangle with Vergne, seen by many as a racing incident, further calling into question the stewards inconsistency regards penalties. Although in comparison Webber would have jumped at the chance of a fourth place finish, Vettel’s adventurous strategy didn’t quite work out for him in the end, although was a mere 0.2 behind Hamilton at the finish line. Red Bull may be keeping a British stiff upper lip about their troubles from Malaysia and vehemently denying fractures, but it might by that third time was the charm and the vultures are truly out. It hadn’t gone unnoticed that Ricciardo seems to be the frontrunner for Webber’s seat if/when he decides to leaves (Porsche rumours were doing the rounds again after Webber’s difficult weekend), despite Vergne outscoring him by 6 points last year. He started out the year with two tough DNFs but bounced back here to take a very respectable 7th after qualifying in the same position. The smiley Australian showed a glimmer of what could be unlocked from the STR8, and Vergne did too but his tussle with Webber shut down the possibility of improving his station. This of course won’t just be enough to take the seat from Webber, Vettel won in a Toro Rosso and although that would be a monumental task to the point of impossible, a few more top ten finishes will be needed. Especially when the name of Raikkonen and Hulkenberg are circulating. Maybe not, but it was close enough to secure the second podium in a row. Although Hamilton was unable to keep hold of his brilliant pole position, he did enough and kept Vettel at bay to take the last step and provide yet more proof that he move to Mercedes was correct. Brawn himself on the radio said to Hamilton that they were not quite there yet, but Hamilton must have looked at McLaren’s season and thought that it was enough at the moment. Rosberg suffered an anti-roll bar failure that forced a retirement upon last year’s glorious winner. Granted they haven’t be able to sneak off with a piece of silverware as of yet, but in China the warmer temperatures gave them a chance to have a better look into what they are capable of. Button was of course the greatest victor out of the team, just over half a minute behind race winner Alonso, but double figure points were of great consolation to the team who came to China with just 4 split evenly amongst their drivers. Button was easy on his tyres and even managed to lead the race, but starting on mediums compromised his ability to challenge for the podium, or more points. Perez’s clash with Raikkonen left the Finn with a damaged front nose and himself with less than perfect handling. But it gave rise from comments from the team that suggest they believe he might not quite have the fighting spirit as of yet. “I think he’s been very polite so far this year, he needs to toughen up. He’s been generous in allowing people past him.” That is not what you want written on any report card.